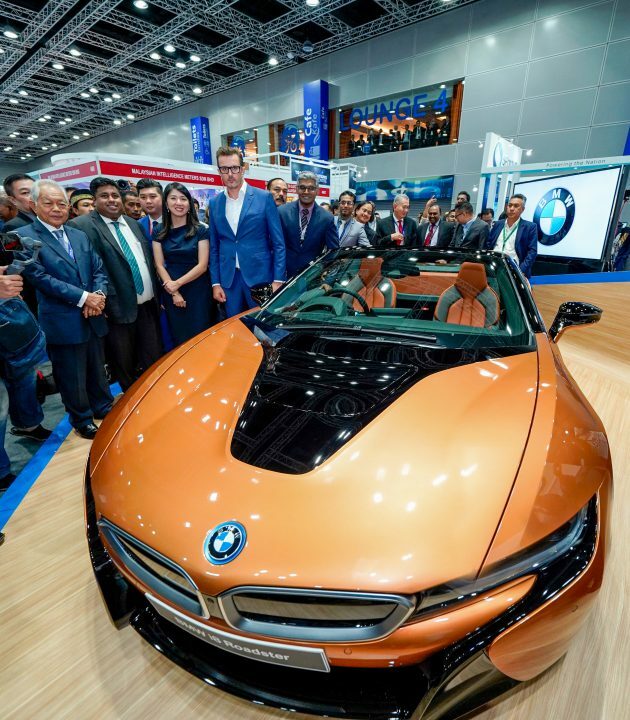 BMW Malaysia today unveiled the First-Ever BMW i8 Roadster, the Icon of a New Era that epitomises the progressive hybrid sports car, at the Conference of the Electric Power Supply Industry (CEPSI) 2018, at which BMW Malaysia is the official E-Mobility partner. Since the introduction of the BMW i sub-brand in 2013, the BMW Group has celebrated immense success with its E-Mobility portfolio worldwide. Last year alone, the BMW Group promised and delivered 100,000 electrified vehicles. With over 82,000 electrified units already delivered in the first eight months of this year – a 43.3% increase compared to the same period last year – the premium automaker is on track to achieve the mark of delivering 140,000 electrified vehicles in 2018. 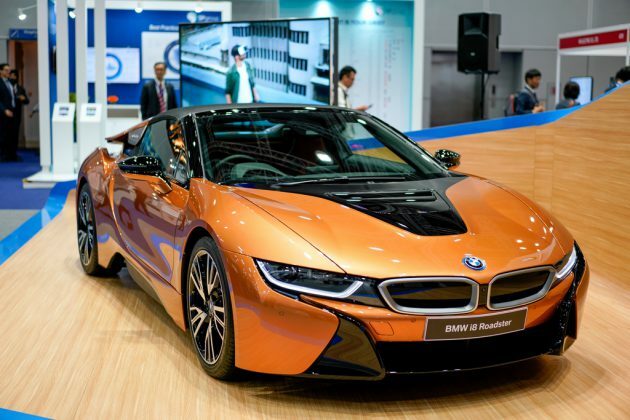 This ambition is pursued by BMW Group Malaysia locally with exceptional performance in its electrified vehicles. 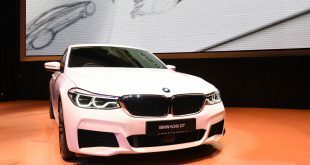 Year-to-date, BMW Group Malaysia has already successfully delivered over 9,500 BMW, MINI and BMW Motorrad vehicles, recording an increase of more than 20% compared to the same period last year. Of the total vehicle deliveries, 56% comprises of electrified BMW and MINI vehicles, indicating the evolving sentiment among Malaysians for embracing Visionary Mobility in their automotive needs. During CEPSI 2018, BMW Group Malaysia will further drive discussion on the Future of Mobility in Malaysia with Dr. Alexander Kotouc. As the Head of Product Management for BMW i, the sub brand of the BMW Group responsible for Visionary Vehicles, Dr. Kotouc will share on the premium automaker’s plans and vision as a leader in automotive sustainability and progressive mobility. 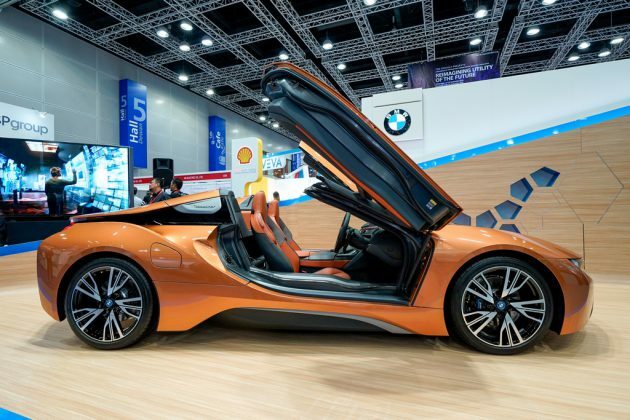 Further solidifying its position as the leading provider of premium electrified mobility, BMW Malaysia also introduced the First-Ever BMW i8 Roadster, which was officiated by the Minister of Energy, Science, Technology, Environment and Climate Change, Yeo Bee Yin, as a special guest at the landmark conference. The First-Ever BMW i8 Roadster is equipped with the most acclaimed features placing it in a league of its own. This year, BMW i8 scored its fourth consecutive win of the International Engine of the Year Award since 2015, a well-deserved recognition of BMW i8’s supremely designed drivetrain. 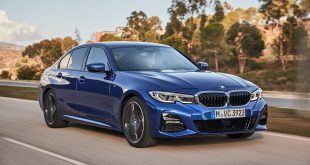 Furthermore, a string of prestigious accolades, including the iF Design Award and the Red Dot Award, testify to the quality and allure of the brand-new LifeDrive architecture for BMW i models. Emotion-packed design, a character all of its own. The First-Ever BMW i8 Roadster imbues emotional appeal in its spectacular design, by carrying over the BMW i design language into a distinctive vehicle concept. The taut soft-top roof has a visual lightness to go with its low physical weight and serves as a defining element of the silhouette in reinforcing the road-hugging impression made by the car’s low centre of gravity. The body’s dynamic wedge shape can also be best appreciated when viewing the two-seater in profile. 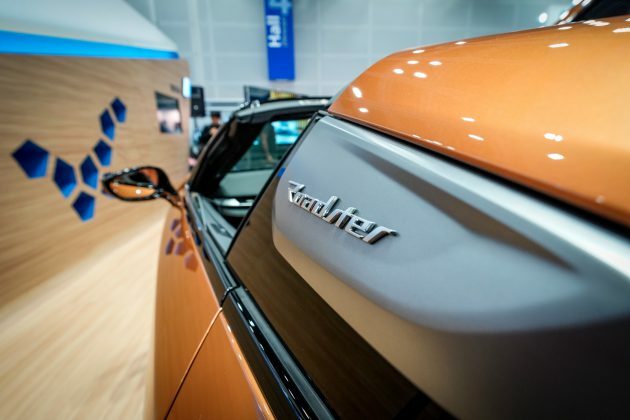 A “Roadster” designation is attached on the C-pillar. 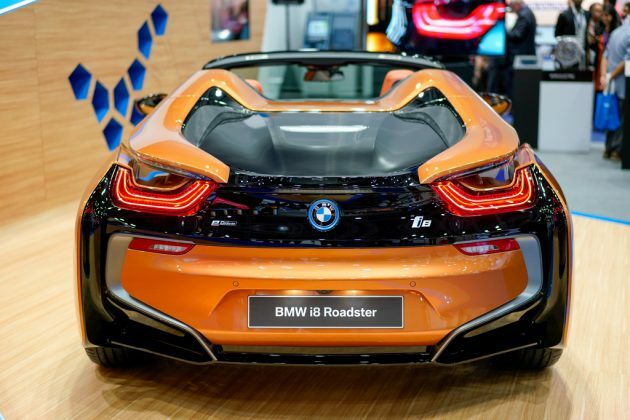 When opened, the First-Ever BMW i8 Roadster’s broad roof retracts fully into the rear end. A unique mechanism allows the soft-top to be folded into a compact package and stowed away in a perpendicular position, creating around 100 litres of additional storage space behind the seats. The all-electric roof opens and closes quietly in 15 seconds, a process which can be initiated while travelling at up to 50 km/h. Dropping down the roof raises the rear window by around 30 millimetres, where it can also serve as a wind deflector that reduces turbulence for the occupants. The height of the fully retractable rear window can be varied as desired at the touch of a button in the cockpit. The Icon of a New Era features a brand new LifeDrive vehicle architecture which offers a horizontally split structure comprising an aluminium chassis and a carbon-fibre-reinforced polymer (CFRP) passenger cell to offer an exceptional degree of design freedom. This clever engineering trick enables the optimal positioning of the necessary drive components to ensure the best possible handling, in addition to ensuring a noticeable weight advantage with the carbon passenger cell. The open-top two-seater comes with newly designed frameless gullwing doors made from CFRP with an aluminium outer shell, while the windscreen frame is made entirely from CFRP. This ultra-strong high-tech material is ideally equipped to provide exceptional rigidity, maximising the car’s occupant protection even if it rolls over. CFRP is also used to manufacture the side skirts with their extra-large cross-section. Additional struts and panels in the front and rear axles also help to maximise the body’s rigidity. The unladen weight of the First-Ever BMW i8 Roadster stands at 1,595 kilograms, a remarkably low figure for an open-top car. Hybrid-specific all-wheel drive, precision-tuned chassis. The electric motor’s power is transmitted to the front wheels and the engine’s drive to the rear wheels, resulting in a hybrid-specific all-wheel-drive system that is controlled by the car’s intelligent energy management. In hybrid mode, the electric motor provides a power boost to assist the engine when the driver is accelerating with particular vigour. It is also able to recuperate energy and feed it to the high-voltage battery on overrun and under braking. The petrol engine’s high-voltage starter-generator can likewise generate additional reserves of electricity, thereby ensuring sufficient energy is on tap at all times for the electric drive system. When the navigation system’s route guidance function is activated, the intelligent energy management ensures the electric motor is employed as extensively and judiciously as possible from an efficiency point of view. The system analyses the route in full and sets up the powertrain management to run on purely electric power, particularly over low-speed sections of the journey. The model-specific tuning of the suspension and damping systems, the specially configured steering characteristics, a firmer roll stabilisation set-up and targeted modification of the DSC parameters together guarantee that the First-Ever BMW i8 Roadster retains all the plug-in hybrid sports car’s trademark handling and performance qualities. Dynamic Stability Control is included as standard. 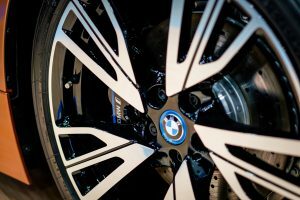 The standard 20-inch light-alloy wheels feature a lightweight construction, with each weighing around one kilogram less than the lightest wheels previously offered for the BMW i8. The internal combustion engine has also undergone further optimisation. The three-cylinder unit extracts maximum output of 170 kW/231 hp from its displacement of just 1.5 litres, along with a peak torque of 320 Nm. In the process, it generates an even sportier soundtrack. A particulate filter is now fitted to further reduce emissions by absorbing the particulate matter contained in the exhaust gases. The system output produced by the electric motor and engine acting in unison is now 275 kW/374 hp, enabling an electronically limited top speed of 250 km/h. The First-Ever BMW i8 Roadster accelerates from 0 to 100 km/h in 4.6 seconds. Its combined fuel consumption stands at 2.0 litres per 100 kilometres, and 14.5 kWh of electrical energy per 100 kilometres. Petrol CO2 emissions come in at 46 grams per kilometre. 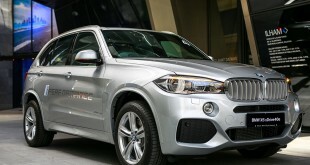 Optimised BMW eDrive technology: more power, longer range – a further enhanced electric driving experience. The rigorously developed BMW eDrive technology and optimised intelligent energy management lead to a significant increase in the number of driving situations where the electric motor can be solely responsible for powering the car. This underscores the ground-breaking character of the First-Ever BMW i8 Roadster and ensures drivers enjoy silent and locally emission-free open-top motoring to the full. Underpinning this new level of electric driving experience is an updated version of the lithium-ion battery developed for the BMW i8. The high-voltage unit is located centrally in the car’s underbody. 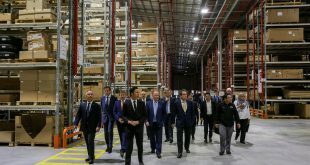 Its cell capacity has increased to 33 Ah from the previous 20 Ah, and gross energy capacity has risen to 11.6 kWh from 7.1 kWh, all of which means the electric motor has more energy at its disposal. The cell configuration allows a peak output of 105 kW/143 hp, making quick sprints possible on pure-electric power. In the standard driving mode, the First-Ever BMW i8 Roadster can be driven exclusively on the electric motor alone – from step-off to a speed of 105 km/h. The combustion engine is only brought into play at higher speeds or when the driver stamps down hard on the accelerator, and is switched off again far more frequently when a measured driving style is maintained. Pressing the eDrive button allows travel at up to 120 km/h on electric power alone. The electric range of the First-Ever BMW i8 Roadster reaches 53 kilometres. Innovative interior with exclusive equipment. The interior of the First-Ever BMW i8 Roadster continues the progressive design of the exterior with a classic BMW i8 drive orientation in line with the sporty, dynamic concept. The upper centre console to the instrument panel curves toward the driver in an acute 12-degree angle. All controls and display elements are within perfect reach of the driver and easy to read. 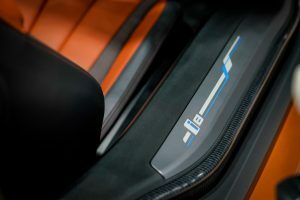 The open-pored CFRP Carbon trim on the centre console, door handle and dashboard inlay, the ceramic controls with an embossed i8 logo on the iDrive Controller, and the ceramic finish on the gear selection lever add a futuristic touch to the interior. The immediately impactful environment gives the driver the impression of being one with the car. The cockpit is fitted out with the BMW Head-up Display that changes to a sports display that includes revs, gears and shift lights when performing manual gear changes in SPORT mode. Other standard specifications include leather sports steering wheel with multifunction buttons and shift paddles, electrically adjustable seats, the multifunctional instrument display, the Driving Assistant including Surround View, and the Navigation System Professional. The main menu in the Control Display is now presented in the form of horizontally arranged tiles with a live mode. The BMW Connected also comes standard, providing access and information to the current charge status, the range and departure time, helping the driver search for charging stations, and having it sent directly to the vehicle, access to the efficiency rating of the last trip, tutorials for particularly efficient driving, and the CO2 calculator. 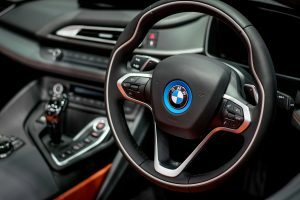 The BMW Connected personal mobility assistant interfaces the vehicle with the customer’s selected touchpoints, such as a smartphone or smartwatch. The First-Ever BMW i8 Roadster comes in Exterior E-Copper with Accaro interior design, and will be available at authorised BMW i dealerships from 19th September 2018. 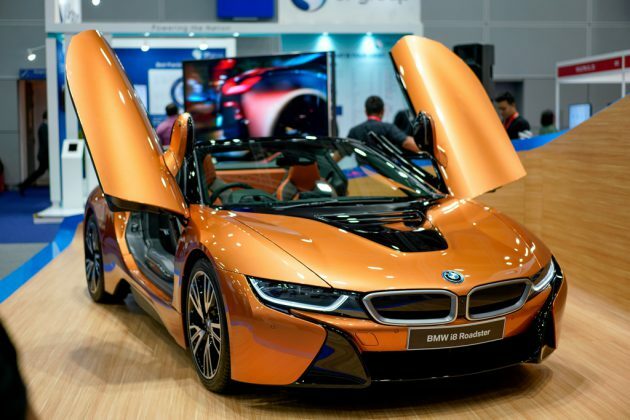 With the Balloon Financing Plan from BMW Group Financial Services Malaysia, the First-Ever BMW i8 Roadster can be owned with monthly instalment plans starting from RM 17,268.00 (based on estimates of an 80% loan on a five-year tenure). BMW 5-Year Unlimited Mileage Warranty with Free Scheduled Service Program. 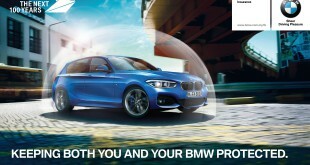 BMW 2-Year/ 24 Month Tyre Warranty Program for its Run Flat Tyre offering and services. BMW Roadside Assistance and Accident Hotline. The BMW Group Loyalty+ Mobile App – BMW White Card.